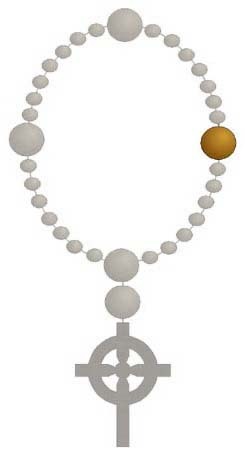 The Anglican Rosary (Anglican Prayer Beads) is used chiefly by Anglicans within the Anglican Communion, as well as by those in the Continuum, and by members of Anglican Ordinariates within the Roman Catholic Church. Its usage has spread into other Christian denominations, including Methodists, the Reformed, Lutherans, Moravians, Mennonites, Baptists, Adventists, Presbyterians and the Orthodox. 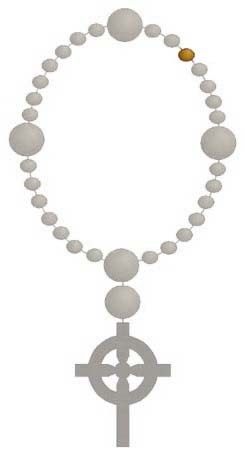 The Anglican Rosary is often used in ecumenical contexts of the universal Christian Church, and for this reason, they are often called Christian Prayer Beads. The configuration of the Anglican Rosary relates contemplative prayer to many levels of traditional Christian symbolism. The prayer beads are made up of twenty-eight beads divided into four groups of seven called Weeks. In the Judæo-Christian tradition, the number seven represents spiritual perfection and completion. Between each Week is a single bead, called a Cruciform Bead as the four beads form a cross. 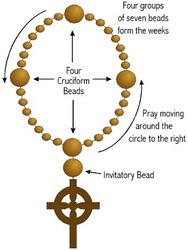 The Invitatory Bead between the cross and the wheel of beads brings the total number of beads to thirty-three, the number of years in Jesus’ earthly life.